"Quick, fresh and tasty. I love the ingredients of this recipe. " 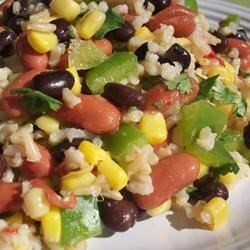 In a large salad bowl, combine the brown rice, kidney beans, black beans, corn, onion, green pepper, jalapeno peppers, lime zest and juice, cilantro, garlic, and cumin. Lightly toss all ingredients to mix well, and sprinkle with salt to taste. Refrigerate salad for 1 hour, toss again, and serve. A perfect potluck partner. Three beans, corn, peppers, and plenty of kick. I served this at a party and it was a hit. Great dish for an outdoor party. We ate it with tortilla chips.